Considering the tremendous success of The Hate U Give earlier this year (and still going strong), I think this title got a bit...overlooked. 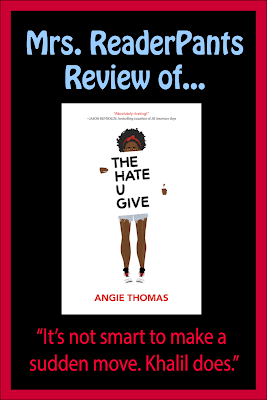 Released in February, just two weeks before the release of The Hate U Give, Piecing Me Together deserves a lot more attention than it's getting. 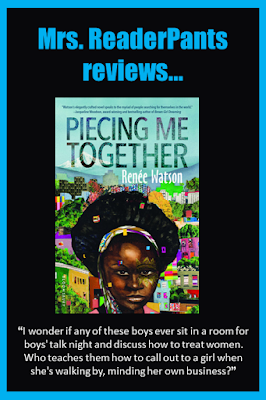 Professional reviews and Goodreads ratings for Piecing Me Together are solid, and I highly recommend it for all school and public libraries serving teens. It's also perfect for middle school readers, some of whom might not be ready for the more mature content of The Hate U Give. SUMMARY: Jade knows that her scholarship to an all-white private high school is her ticket out of poverty. At the urging of her school counselor, Jade joins Woman to Woman, an organization providing mentors to teens at her school. But it seems all the teens being mentored are black. And from poor neighborhoods. WHAT I LIKED: This book is 100%, totally and completely, needed in all school and public libraries. 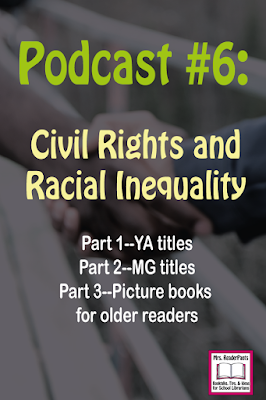 There are not enough books by African-American authors featuring African-American characters in our libraries and in mainstream YA literature. Piecing Me Together fills a void for an underrepresented audience that needs to see themselves in the characters and situations they read about. I loved the way the teens use their artistic talents and work together at the end to help a total stranger's family. I loved the portrayal of a strong African-American family that is struggling financially but is still involved in each other's lives. Even though Jade's mother works long hours and must stretch every dollar, she still opens her home to her younger brother (Jade's uncle E.J.) when he needs a new place to live. It's another mouth to feed and they don't have any extra space, but Jade's mother accepts E.J. into their home without hesitation or complaint. I hope this book will help readers see how little comments they make or actions they think are insignificant can be incredibly hurtful. 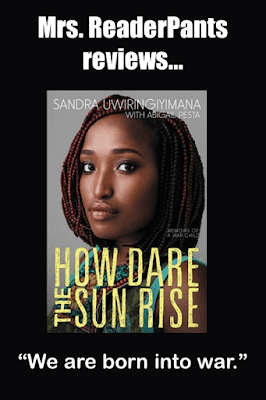 This everyday racism often grows from ignorance and fear, and Piecing Me Together shows readers the effects of daily microaggressions based solely on skin color. WHAT I DIDN'T LIKE: I have to be honest, I didn't really like Jade so much at first. I got frustrated with her reluctance to speak up when she felt wronged. I thought she was too hard on Maxine, her mentor, who is only a few years older than Jade and brand-new to mentoring. She has problems in her own life, just as we all do. While Maxine isn't so reliable at first, she's at least trying to help Jade (who is a total stranger to her). And even though she is distracted at times, she is receptive to Jade's opinions when Jade finally decides to speak up. Maxine asks Jade what she's thinking and gives her lots of opportunity to say what's on her mind. It isn't Maxine's fault that Jade doesn't tell her, and it's unfair for Jade to blame Maxine for not understanding why Jade is aloof and considers quitting the Woman to Woman program. That said, Jade does find her voice and recognizes it is unfair of her to expect Maxine to just know what Jade is thinking. I loved this slow maturing of Jade's character. It's authentic and makes Jade much more likeable for the last third of the book. This is one of those "pensive" books, where there is a lot of inner monologue and not a lot of action. Some readers will love that; others won't. THE BOTTOM LINE: A much-needed addition to any school or public library. I think many teen girls will identify with Jade. I just recently read this book and had the same thoughts as you! I will have to order a few copies of it to satisfy what I think will be popular demand among my MS girls. Yes! One copy won't likely be enough at my school, either!